Despite the fact that my fridge is full of apples, there isn’t one apple present in today’s recipe. (Don’t you love how I snuck in an apple into my baked pasta recipe yesterday? Ha.) More apples recipes to come, but this simple to make breakfast is all about the ricotta. These pancakes are light and fluffy and have a nice tang from the orange zest (although lemon zest could be subbed in too). Cornelius wasn’t too sure about having pancakes with cheese – he obviously never grew up with my dad’s amazing cottage cheese pancakes – but after the first bite he was converted. This recipe makes for a pretty thick but delicate batter. Be careful not to add too much batter to the pan and make sure you gently smooth over the tops. The key is to get a nice crunchy edge which adds a nice contrast to the pillowy soft interiors. We topped ours with my favorite sour cherry jam, but warmed honey or a sprinkle of icing sugar would be perfect too. 1. In a medium-sized bowl, combine the ricotta, eggs, sugar, zest and vanilla. Gently fold in the flour. 2. Melt better over medium-high heat in a cast iron frying pan or griddle. Add a large tablespoon of batter for each pancake, slightly smoothing over the tops. Cook for 4 minutes per side. Serve with fruit preserves (I love sour cherry jam). Sounds divine. I’ve been hunting breakfast recipes lately. Thanks! The orange zest in these is what drew me in. They sound wonderful and I can’t wait to try them with some Sicilian ricotta! Alas – I’m afraid to say that I can’t try out this recipe as I have “issues” with soft cheeses. Well actually, I don’t have the issue – my gut does but nevertheless – these pancakes look really good AND sour cherry jam is one of my favourites. Ohh, these look lovely and light. I could eat pancakes for breakfast every day! And bacon, and eggs, and and and… I just love breakfast! claire, breakfast is probably my most favorite meal of the day! the orange zest is wonderful in this, nicole! I made some orange ricotta pancakes last weekend and they were a disaster. They wouldn’t firm up enough to flip but the ‘experiment’ results tasted gorgeous, so I’ve been looking for a recipe that works. I’ll definitely be making these on Sunday for a lazy breakfast! Many thanks! jen, these are delicate and do require a bit more care in flipping…which is why i suggest to make them small. good luck! I made some lemon ricotta pancakes *with cherries that I pitted and chopped up* (oh the work) from the Jamie’s Italy cookbook, and they weren’t all that great. I’m sure yours were better. I made your oatmeal apple loaf last night and I love it. Ricotta is my favorite cheese! I used to add it only for making cheese cakes or mouses. Thanks a lot for the idea to make pancakes with this cheese! I LOVE cheese and the combination of ricotta and orange zest seemed so good… and indeed those pancakes are, I made them this week-end and we loved them! They’re so moist and fragrant, it’s a great and easy idea. We tried all sorts of toppings, and plain butter, honey or a crunchy nut preserve did great with them. Still, I would have prefered slighly fluffyer or lighter pancakes, and will try perhaps to beat the whites before adding them instead of adding the eggs altogether. I simply used a hand wisk (less dishes), and did not let the mix rest (as suggested with regular buttermilk ones), could that explain it? Thx for that recipe, I will for sure keep it in my book! These are just my idea of perfect breakfast – I love pancakes, and if they are orange-y, even better! lydia, glad you liked the apple bread. 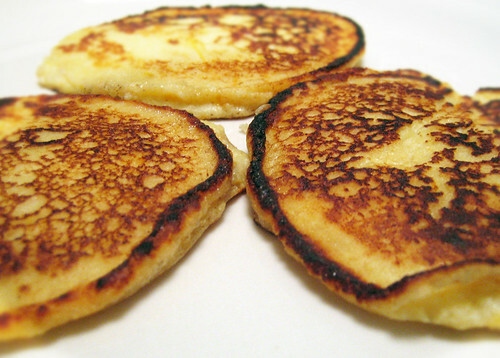 as for these pancakes, they are really simple to prepare…no chopping and the results are pretty delicious. kristalina, mmmm, ricotta! yum. definitely give this a try, it’s a delicious way to enjoy your favorite cheese. iris, i think seperating the eggs would yeild a very light and fluffy pancake. glad you liked them, anyways! I love your description of “breakfast on a cloud.” And I love pancakes, but have never made a ricotta version (I’m stuck on blueberry cornmeal). I’m going to save this bc I love the orange in there. Just came across this post…oh, why oh why couldn’t I have found it this morning before succumbing to the easy-ness of bagels? (OK, they were good bagels…but still). I made these yesterday for breakfast and the aroma was just about as good as the pancakes! My husband loved them and I will definitely make them again. 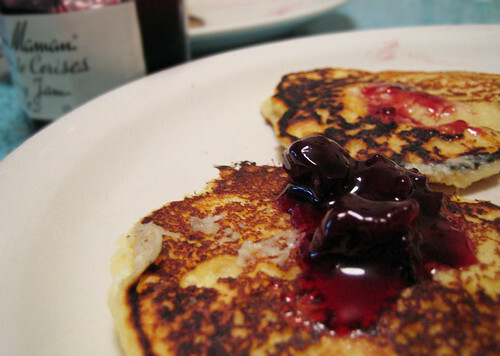 The cherry preserves on top were a great compliment to the sweetness of the pancake. Fantastique! Simply amazing. I have been raving about these (and your site) to my friends. I made a batch for the first time for my Mom this past weekend and they were great. I did not have sour cherry jam, but I made a raspberry jam sauce and it worked wonderfully. Warmed honey was a great idea, too!